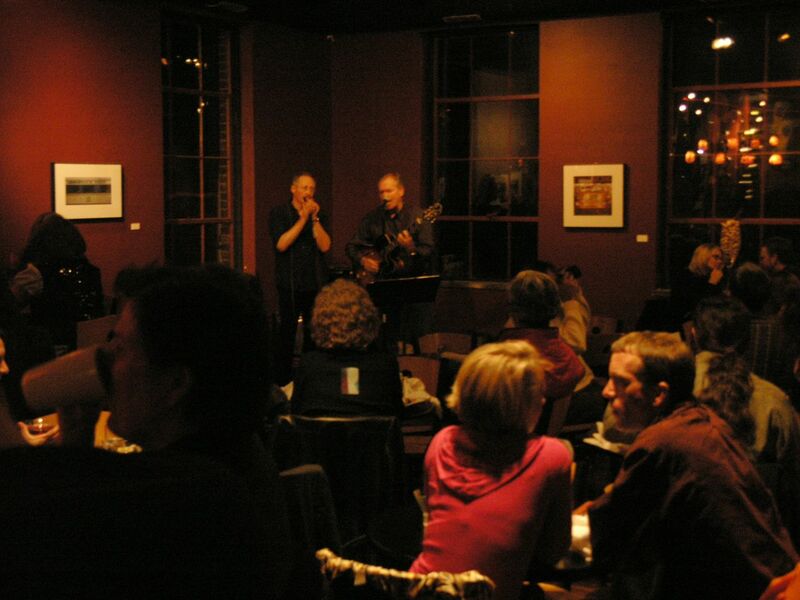 Elixir, an inventive dining destination in White River Junction that featured live music five nights a week, closed its doors Saturday with a final show. Harmonica player Johnny Bishop and guitarist Ed Eastridge, working as a pared-down version of “Johnny B. and the Goodes,” played an evening of blues. Billy Rosen joined them midway, adding some jazzy flair to the duo’s material. Musical highlights included a funky version of “Tequila,” complete with audience participation, and an ethereal cover of the Beatles’ “Come Together,” featuring Rosen’s inventive guitar improvisations. Bishop also played every track from his recently released “Have Mercy,” a CD he said was getting major airplay in, of all places, Poland. It’s also big in Macedonia, he said, proving that music speaks every language. Tim Utt and Barbara Blaisdell, who’ve performed at the club several times as “Sensible Soul,” a duo version of their band “Sensible Shoes,” sat at a table in the back of the restaurant took it all in. Owner Mike Davidson said the difficult decision to close Elixir was a personal one. “With several other businesses and two young children, it doesn’t work for us as a family to run a restaurant,” Davidson said in an email sent just one day before the restaurant’s final night. Elixir’s closing leaves a big hole in the local music scene, not to mention the end of a clever food menu that featured the best pomme frites – OK, French Fries – anywhere in the area. But the mood Saturday, at least around 9-10 o’clock, wasn’t one typically found at the end of an era. It felt more like an interlude, a transition. Perhaps it’s because Mike Davidson isn’t closing due to failing business. By 8 o’clock Saturday, several small plates items on the menu were no longer available; a couple of beer kegs were tapped dry, and wine was being delivered in martini glasses. That was the plan, said Davidson – use up all the supplies, then lock up. He’s holding out hope that a buyer can be found. Davidson said there were a “few parties” who’d expressed interest in taking over the restaurant, but declined to name them. “It has been truly enjoyable and I will miss the musicians most,” Davidson said in his parting email. But with any luck, the parting will be short-lived.